I had only heard a little bit about this movie, but was very intrigued as the usual werewolf movies I have viewed, had only male characters in the leads, rather than two teenage girls. After viewing, I knew I had found a movie that I would come to love for the rest of my life and that I couldn’t wait to show all of my friends the movie I had just found. Granted, when this film came out, it was quite controversial as it depicts some savage violence by two high school students against their peers and teachers. A subject that hit a little too close to home with the recent events from Columbine. But that set aside, director John Fawcett and his writing partner Karen Walton (both of who’ve gone on to create and produce ‘Orphan Black‘), has perfectly woven a story about two oddball sisters who are very loyal to one another, where one finally receives her “womanhood” so to speak or has hit puberty. Thus she is on a path of self discovery, rebellion, and boys. But as our main character is transforming from a girl into a woman, she is also transforming into a lycanthrope. It’s genius on all levels and packs a good amount of gore and some great characters who became instant cult icons. ‘Ginger Snaps‘ follows the Fitzgerald sisters, Brigitte (Emily Perkins) and Ginger (Katharine Isabelle), who live with their parents in the quiet suburbs where every house looks the same, the grass is always cut, and children are outside playing constantly. But Brigitte and Ginger aren’t the normal suburbanite sisters you think they are. In fact, they are the two girls your parents might disapprove of by looking at them, as they have an obsession with death, dress in black, and spend their free time taking portraits of themselves in gruesome crime scene photos. They usually keep to themselves at school, where all the popular kids tend to mock them constantly. Meanwhile, their mother (Mimi Rogers) and their father tend to look the other way and not be interested in their daughter’s lives at all, although their mother tires desperately to bond with them. But then one day, the older sister Ginger takes that first step into womanhood by getting her period, thus her mind, body, and soul start the transformation into adulthood. However, one night while the two sisters are walking home, Ginger is attacked by some beast, which is then hit by a car. The two sisters seem to think it was just some kind of mad dog, but soon enough Ginger begins showing signs that she is turning into a werewolf, tail and all. And her younger sister Brigitte must stay close to her and clean up her messes so that nobody finds out what exactly is going on. But when schoolmates, and the neighborhood pets go missing, the sisterhood bond between Brigitte and Ginger is put to the ultimate test. Fawcett and Walton have perfectly crafted a tight-knit screenplay that on one-hand plays out like an old fashioned horror film with blood and guts, but it also has those strong layers of becoming an adult thrown in there too. And Perkins and Isabelle sell it completely. Even the title is genius – ‘Ginger Snaps’. If you were to add one werewolf movie to your collection, make it this film. You won’t be disappointed. ‘Ginger Snaps’ comes with a decent 1080p HD transfer and is presented in 1.78:1 aspect ratio. This is a new high-definition transfer of the film and is by far and upgrade from the previous DVD releases. The budget was very low on this Canadian film, but that being said, this new transfer looks quite good, despite a few nit-picky problems. Overall, the detail is vivid and sharp with great closeups that show well defines wrinkles, makeup effects, and individual hairs on the actors. When the scene isn’t as bright, the image gets a little softer, giving it a flatter look. Colors look very good, although they seem a tad bit muted here and there. Though when the werewolves and horror start biting its way through, the blood is very read and the bones are very white. At those moments, the colors pop off screen. Black levels seem to run deep during the well lit scenes, but in the darker scenes, they get a bit cloudy with some noticeable crush. There is a nice fine layer of grain, still keeping the movie in its filmic look too, although there are some minor instances of some heavy digital cleaning. Skin tones are natural and smooth and despite some light video noise, this is one decent video presentation. This release comes with an impressive lossless DTS-HD 5.1 audio mix as well as a DTS-HD 2.0 stereo mix. For those of you without a surround sound system, the 2.0 mix will do you just fine, however, the lucky people with the 5.1 surround sound set up with fully benefit from this excellent audio track. Being a horror film, it hits all of the right notes with scares, eerie music and a good rock soundtrack. The dialogue is always crystal clear and easy to understand, and is free of all cracks, pops, and hissing. It’s perfectly situated on the center channel as well. The sound effects are killer with grizzly roars and haunting growls in the distance, sounding robust and loud in the rear speakers. It’s a full immersive audio track that puts you at the center of the creepy action and might have you looking behind your wall or couch to see if there is a monster. The soundtrack is also good with a great score from Michael Shields that never drowns out the dialogue or sound effects, which gives you a great audio mix. Audio Commentary #1 – The first commentary track is with Director John Fawcett, who gives a fun and very informative commentary. He discusses the origin of the story, filming with actors and actresses, along with some fun stories on set and his personal reflection on the film itself. If you’re a fan of the film, this is worth listening to. Audio Commentary # 2– The second commentary track is with writer Karen Walton who gives a more in depth discussion on the tones and themes of the film. She dives in to what the film means to a teenage girl as well as her own personal opinions on how the final film turned out. If you’re a fan of the film, this is worth listening to. ‘Ginger Snaps’: Blood, Teeth, and Fur (HD, 67 mins.) – This is an AWESOME bonus feature with tons of interviews with the cast and crew present day on the making and cult success of the film. They all discuss what it was like making the film, the impact it has had over the past decade, and some fun tidbits of information from the movie set. A Must watch. Growing Pains: Puberty in Horror Films (HD, 28 mins.) – This is another fun bonus feature that features a few female horror movie fans who are professional writers and filmmakers, discussing the female characters and their perspectives in the film as well as other horror movies where females are key. Deleted Scenes (HD, 26 mins.) – There are several deleted scenes here, which are scattered throughout the menus, oddly. But all of which are worth watching at least once, to see what was cut. Featurette (HD, 5 mins.) – Here is a promo puff piece on the making of the movie, which seems to be from when the movie came out. Creation of the Beast (HD, 5 mins.) – Here is a brief look at the make up effects that went into creating the werewolf. Being John Fawcett (HD, 2 mins.) – Much like ‘Being John Malkovich’, this short extra has a point of view from Fawcett’s perspective as he is talking with his two lead actresses. Trailers (HD, 5 mins.) – Here are some trailers and TV spots for the film. Production Design Artwork (HD, 2 mins.) – Here is a slideshow of some of the designs for the werewolf. ‘Ginger Snaps‘ is by far one of my favorite werewolf movies. The undertones of what it means to be growing up and entering adulthood or womanhood is parallel to possibly being a werewolf. Well at least it is here. Add to that the loyalty and love of two sisters that never break that bond. The characters are great, the script is wonderful, and the scares and comedy are all top notch. The video presentation won’t move mountains, but the audio presentation is quite good. There are some excellent extras on this disc as well, all worth watching. 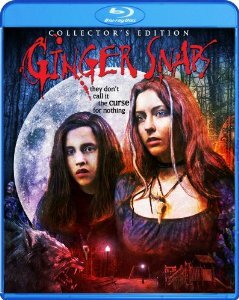 That being said, this Blu-ray of ‘Ginger Snaps’ is definitely worth purchasing. This entry was posted on Friday, July 25th, 2014 at 4:45 pm	and is filed under Film, News. You can follow any responses to this entry through the RSS 2.0 feed. You can skip to the end and leave a response. Pinging is currently not allowed. « ‘Firefly’ Online Game Makes Us All Big Damn Heroes !!! !